The German U-Boat U.87 fired 2 torpedoes at the freighter "Port Nicholson". Both torpedoes hit the ship and several hours later she sank. What is remarkable about this ship is that she carried a secret cargo of bullion headed from Europe to the U.S.
That cargo is 71 tons of platinum. At the time of sinking, it was un-salvageable because of depth restrictions, and the fact officials placed her sinking in the wrong spot. 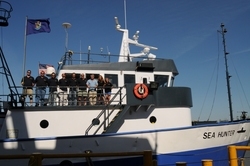 She was not to be found until Sub Sea Research began the hunt in 2007. The company filed a federal claim on the site as soon as the wreck was located.